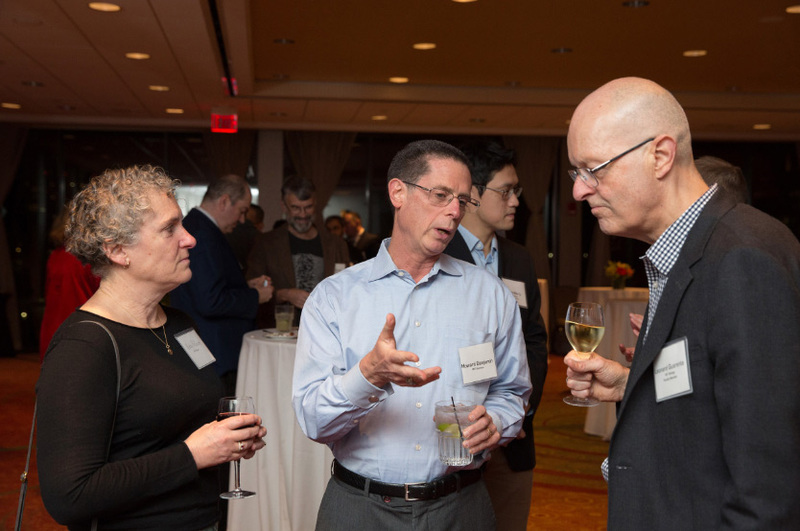 Members of the MIT biology community came together on Nov. 7, 2018, to celebrate the department’s myriad accomplishments at the inaugural Friends of Biology Reception at the Hyatt Regency Hotel along the Charles River. Current students, alumni, faculty, staff, parents, supporters, and industry representatives gathered to recognize the remarkable achievements of the Department of Biology, and to honor the many generous supporters who make it all possible. Guests had the opportunity to mingle with faculty and students, who discussed topics including the importance of basic science and research, and applications of this work in cancer, genetics, immunology, and microbiology. Alan Grossman, Praecis Professor of Biology, and head of the Department of Biology, opened the program portion of the evening by thanking attendees for their crucial role in enabling innovative biology research at MIT. He highlighted recent progress and accomplishments by biology alumni, students, and faculty. Five biology graduate students then spoke about their career paths and described the research taking place in each of their diverse laboratories. Rebecca Silberman described the work of the Amon lab, which examines basic biological processes such as cell growth and division, and how errors in these processes lead to disease. Conor McClune shared that in the Laub lab studies are revealing how cells process information and regulate their own behavior. Steve Sando of the Horvitz lab noted their progress in using nematodes to learn more about fundamental human biology and the development of disease. Jose Orozco discussed research from the Sabatini lab at the Whitehead Institute, which focuses on growth and metabolism regulation in mammals. Frances Diehl, a student researcher in the Vander Heiden lab, concluded the evening by detailing her team’s efforts to better understand cell metabolism and its role in diseases like cancer. Daniel E. Griffin, the development officer for the department and organizer of the event, said the reception had registrants from five countries and 13 states and received such a positive response that it will be held annually as a signature event. Faculty members in attendance included Robert Horvitz, David H. Koch Professor of Biology; Robert Sauer, Salvador E. Luria Professor of Biology; Amy Keating, professor of biology and biological engineering; Rebecca Lamason, Robert A. Swanson Career Development Assistant Professor; and Gene-Wei Li, assistant professor of biology, as well as Michael Sipser, dean of the School of Science.